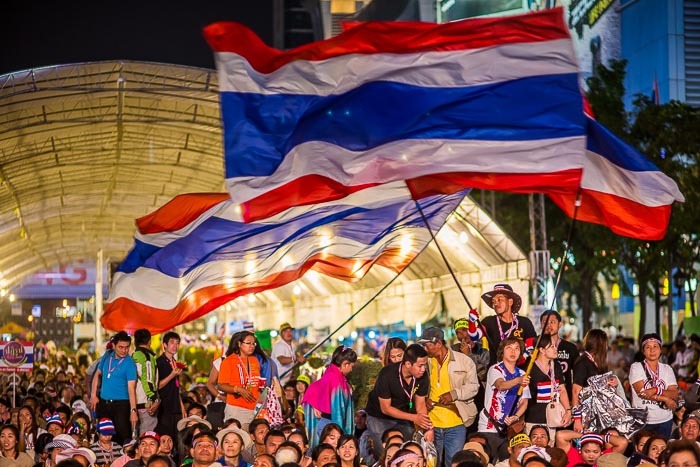 Anti-government protestors wave Thai flags at the Pathum Wan stage, near MBK, on the 12 day of Shutdown Bangkok. Friday was the 12th Day of Shutdown Bangkok, the assignment that never ends. I'm not photographing every day of the Shutdown at this point. 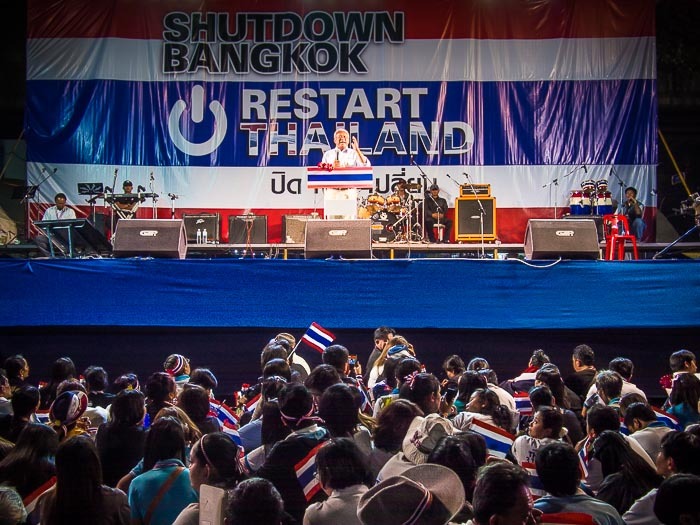 Bangkok is adjusting to the shutdown and the novelty is wearing off. Unless there's a specific event (like the grenade attacks last week) I go out every couple of days to photograph the protest stages and see how the city is changing. 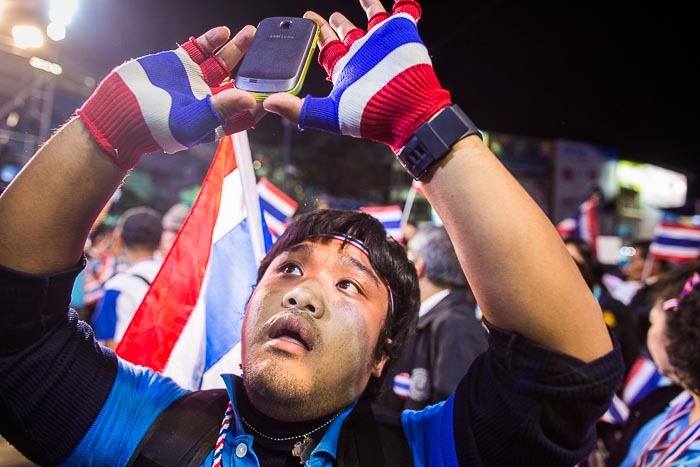 A protestor photographs Suthep Thaugsuban with his smart phone. Crowds at the protest stages are getting smaller every day. Suthep still fires them up with his evening speeches but during the day there's hardly anyone at the stages. Of course an intersection blocked by 100 people is just as closed as intersection blocked by 10,000, but it seems to show some flagging interest in Shutdown Bangkok. That's not to say it shows increasing support for the Prime Minister Yingluck Shinawatra. It doesn't, she's still widely despised by the protestors. More than anything I think it reflects weariness with the protest. This is a city built on commerce and Shutdown is disrupting commerce. Tourist arrivals are down, airlines are canceling flights, the economy (already in recession) is faltering, Bangkok real estate prices have fallen for the first time since the 1997 Asian economic crisis and leading business groups are predicting a huge hit to the Thai economy if the protests continue. The markets hate uncertainty and only thing certain about Thailand right now is that uncertainty will continue. Suthep on the Pathum Wan stage. To me, this is looking less like a political protest and more like an existential battle for the Thai soul. Suthep has said repeatedly he will not negotiate. His only demand is that Thaksin (and his allies) are purged from the Thai body politic. Thaksin is one of the richest men in the world and is living in comfortable exile in Dubai. 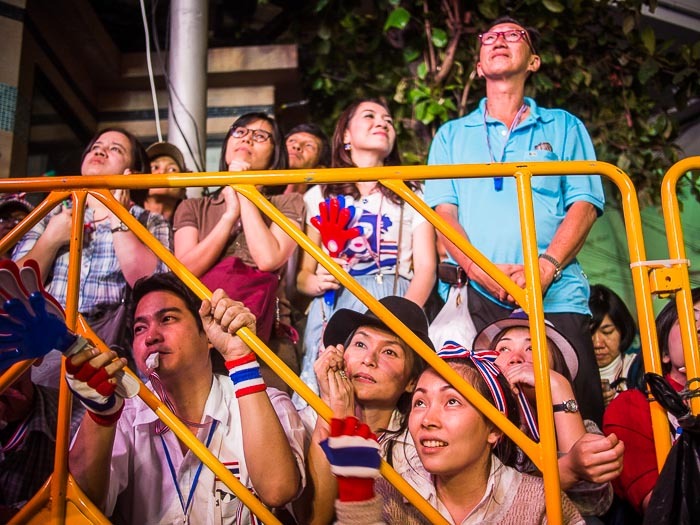 The two titans are locked in a battle for Thai democracy. And the people killed or hurt in grenade attacks, random shootings and riots are the collateral damage in their battle of wills. People wave Thai flags and cheer for Suthep while he launches into a fiery attack on PM Yingluck from the Pathum Wan stage. I get asked a lot if it's safe to visit Bangkok. Yes it is. In fact in some of the most heavily visited parts of the city, around the palace and Chinatown, you wouldn't even know the protests are happening. Participating in the rallies, though, is a monumentally bad idea. When I go to a protest site I wear my press credentials and dress neutrally (i.e. no colors favored by either side). If people ask what I think, I tell them it's up to the Thai people to settle this. There is absolutely no police presence at any of the protest sites. Security is provided by Suthep's loyalists guards. If something happens that requires police action you're on your own. The guards are a law unto themselves and can't be counted on to help if you get in trouble. Also, some of the stages (each has its own "personality") are becoming somewhat lawless and it would be easy to get into trouble, especially after dark. People listen to Suthep at Pathum Wan. Early voting is Sunday, January 26. Suthep and his supporters have promised to have vigils at each of the polling places but not disrupt or prevent voting. 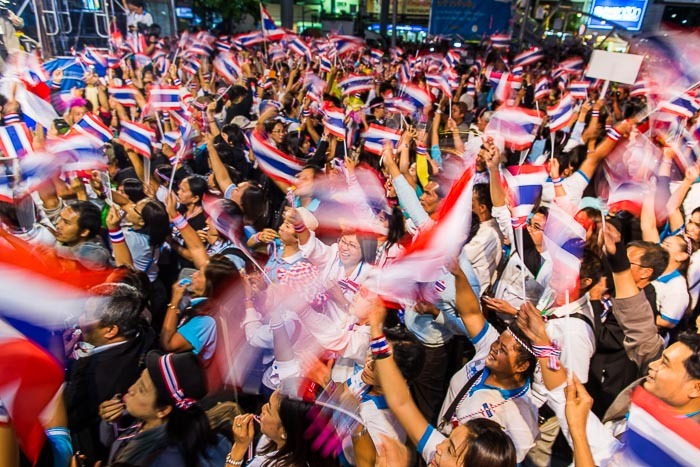 It should be a preview of what things are going to like next week, when Thais go to the polls on Feb. 2. There are more photos of the 12th Day of Shutdown Bangkok (along with lots of photos of Shutdown) in my archive or available from ZUMA Press.